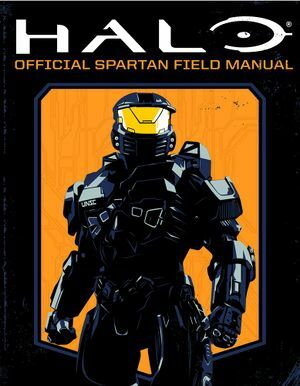 The Halo: Official Spartan Field Manual is a reference book on the Halo universe that was released on September 25, 2018. “ Spartans. Humanity's first-and last-line of defense in a hostile 26th century galaxy. You have been selected to join their ranks. The Official Spartan Field Manual is a guide to every element of the United Nations Space Command (UNSC) SPARTAN-IV program, disseminated to all newly-augmented Spartans. Inside these pages is the guidance you'll need to put your enhanced strength, speed, and skills to use in both War Games training simulations and, ultimately, joint combat operations. This manual is essential for getting to know the weapons and vehicles you will be using on the battlefield, as well as the allies and enemies you can expect to encounter. COMPULSORY READING FOR ALL SPARTAN-IV FIRETEAM LEADERS AND COMMANDERS. The book is divided into ten sections: Introductions, the SPARTAN-IV Program, Physical Fitness Guidelines, History of the Spartan Program, ONI Augmentation Report, Battlefronts, Spartan Dossiers, UNSC Organization, Alien Factions, and the Spartan Armory. The book is written as an official guide for a new SPARTAN-IV recruit recently assigned into the UNSC Infinity, with additional info added by Spartans Gabriel Thorne and Tedra Grant. On page 62, the Truth and Reconciliation is referred to as a carrier. On page 74, it states that John-117 was in cryosleep for six years, instead of four years. On page 84, Operation: PROMETHEUS is dated June 2537 instead of July. On page 85, the approval of the SPARTAN-III program is dated 2431 instead of 2531. On page 113, an occurrence of Fireteam Jackknife is written with a single “k”. On page 141, the abbreviation for the rank Crewman is indicated as “CR” instead of “CN”, repeating the abbreviation for Crewman Recruit. On page 153, the Sangheili Major and Sangheili Zealot images are swapped with each other. On page 181, the redundancy “Mark V and Mark V” was most probably intended to be “Mark V and Mark VI”.